We all know Benjamin Franklin’s famous quote, don’t we? ‘In this world nothing is certain but death and taxes’. Well I’d like to add a third thing to that list and that is that life always changes. Very rarely do we stay in the same situation for our entire lives. We move home, we change jobs, we have children, and sadly, even marriage is far from a done deal these days. Our situation in life changes constantly and as a result we will always be faced with times of transition. It’s true that there are some people out there who probably relish change. By and large though, I’d say the majority of people don’t like change one bit, or we think we like it until we are actually faced with it. Periods of change and transition can be difficult and they can require a great deal of inner strength and patience. In times of change, strength could be needed to cope with a variety of circumstances. Let’s take moving home for example. Moving home can be an extremely stressful time. Not only are you trying to deal with all of the worries and stresses of day to day life, you’re also trying to deal with the emotional and physical aspects of finding somewhere to live, packing up your belongings, changing the address on all of your accounts, licenses and bills, while at the same time dealing with the worry that it could all fall apart at any time. No easy task. What about if you are changing jobs? Whether you have chosen to change your job or whether you have been forced to, changing your employment can be an extremely stressful time, a time that will again require a great deal of inner strength and determination. If you have been forced into the change then you may first be faced with the difficult challenge of restoring your confidence and finding a new job. Then you have the financial pressure of the transitional period while you are between jobs, topped off with a possible need to learn new skills and methods of working when you do find a new job. If you’ve chosen to head into a new job, then you may still need a great degree of strength to manage the change and you may be faced with the worry of whether you’re doing the right thing. If you’re currently facing any of these challenges then it is vital to maintain that inner strength. If you start to really feel the pressure then try and remember that you are not the only one facing these challenges and try to give yourself a mental break. If you stay strong during times of transition then things will come good eventually, if you don’t then things will inevitably crumble. Patience is a virtue and never more so than in times of change. Is there really such a thing as a perfect transition? Personally I can’t recall any major change in my life that went 100 percent to plan. Yes things have always been dragged back onto plan but sometimes it has required a little patience while problems have been resolved. At other times, simple lack of experience has caught me unawares. This can happen in all avenues in life and sometimes you may just need to give things a little bit of time for life to get back to normal or for things to come good again after a major change. I’m not saying that we shouldn’t move forward and actively pursue whatever goals we have, things won’t fix themselves. At the same time though, it would be unrealistic to expect things to happen overnight. We all hate road works, right? I know I do. Are they necessary? Yes. Do we like them? No. Sometimes life can feel like we’re stuck in one long unending stretch of road works, we just want things to start moving! Eventually things always get moving again, sometimes you just have to be patient and work your way through any delays. Quite often a nice new smooth road appears ahead because sometimes, change can be good. In our fast moving world one thing is guaranteed, if you’re not moving forward then you’re moving backwards. Change – however much we may dislike it – is necessary. Let’s think back to those road works. We may not enjoy being stuck in heavy traffic, but we’d soon be moaning if our car was damaged by a pothole in the road or worse yet, we couldn’t get home because the roads were undrivable. Yes change can be difficult and strength and patience are required, but once the change is over, life soon returns to normal and often times it is better than it was previously. So if you’ve had a time of change forced upon you, be strong, be patient and just get on with it. Today’s world doesn’t allow room for self-loathing. Investing in Whisky ~ A Smooth Investment for Rough Times? Is Moving to Australia Still a Smart Financial Move? I think change is universally difficult for people to accept but it prevents stagnation and helps people move forward in life. I have always tried to be accepting of change, even change that I may see as negative because you never know what opportunities arise from it. I embraced change quite easily when I was younger Daisy but as I’ve gotten older I have to admit that I’m getting more set in my ways. Whether I like it or not though, change will always come and you’ve got to be able to deal with it in a positive way. I agree Deacon. 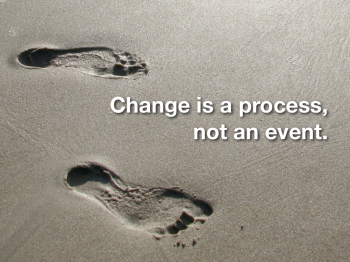 There’s no progression without change, however hard it may be at the time. Great article! I especially like the road works metaphor! I am looking to get married soon, so I am happy to have found this in great time! Like a muscle, we need to keep moving and changing to become stronger.